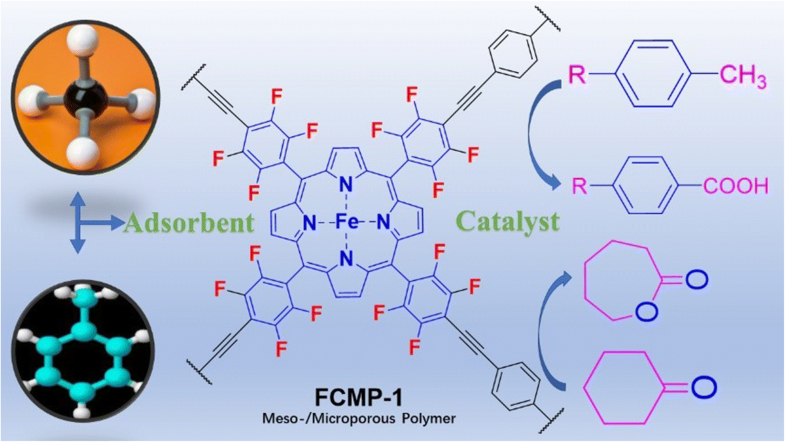 A conjugated micro/mesoporous polymer based on fluorinated iron-porphyrin, FCMP-1, has been prepared via Sonogashira-Hagihara coupling polymerization. The BET-specific surface area of FCMP-1 is about 440 m2 g−1, and its pore sizes are mainly distributed in 0.81 nm and the range of 2.9–3.4 nm, which show that FCMP-1 is the micro/mesoporous polyporphyrin. The polymer shows moderate uptake for methane (4.23 wt%, 273 K) and toluene (615 mg g−1, 298 K). It was also studied as the heterogeneous oxidation catalyst for the oxidative transformation of substituted toluene to corresponding benzoic acid as well as Baeyer–Villiger oxidation using dioxygen as an oxidant. The yields of substituted benzoic acid are ranged from 77 to 88% by employing FCMP-1 as catalyst. Particularly, the yields of the reactions for producing ε-caprolactone (more than 99% selectivity) are ranged from 85 to 98%. The channels derived from the porous structure of Fe-porphyrin network are advantageous for the reactive molecules to contact with the catalytic sites and accelerate the diffusion of reactant and product. When compared with the polymer analogue without fluorinated substituents, FCMP-1 with fluorinated phenyl substituents demonstrates the better catalytic performance and cyclic utilization. The fluorinated phenyl moieties linked to Fe-porphyrins facilitate the transformation, due to their stabilizing effect on porphyrin to restrain the breakdown of the catalyst. Micro/mesoporous conjugated fluorinated iron-porphyrin polymer FCMP-1 was synthesized. Its uptake performance and catalytic activity for oxidation were also studied. The online version of this article ( https://doi.org/10.1007/s42114-018-0063-0) contains supplementary material, which is available to authorized users. 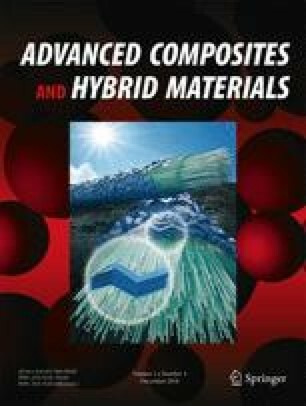 As one of the porous organic materials different from the inorganic microporous zeolites and activated carbons, conjugated microporous polymers (CMPs) with extended π–π-conjugated backbones and high permanent porosities have attracted the growing attention for the research and application in gas adsorption and storage [1, 2], light emitters [3, 4], and heterogeneous catalysis [5, 6]. All the porous organic materials including CMPs can be synthesized from suitable monomers with various structures via selected polymerization reactions [7, 8]. The π-conjugated macrocyclic systems such as porphyrin is one of the building blocks mostly used for the synthesis of polyporphyrin CMPs [9, 10], which usually possess high stabilities and permanent porosities . Macrocyclic iron-porphyrin is an analogue of hemoglobin cofactor in chrome P450 enzymes, which is fundamentally important to a series of biochemical reactions of the organism [12, 13]. However, two main factors have obstructed the application of iron-porphyrin as an efficient oxidation catalyst for the excitation of dioxygen. One is the oxidative degradation of the macrocycles structure of iron-porphyrin , the other is the formation of μ-oxo dimers . Both can lead to the inactivation of iron-porphyrin. To confirm Fe-porphyrin catalysts in some oxidation reactions, the formation of CMP with the iron-porphyrin polymeric network is reported by mimicking biological systems . Iron-porphyrin-based porous organic materials have attracted considerable concerns on account of their potential application in non-toxic, recyclable, reusable, and cost-effective heterogeneous oxidation catalysts [9, 10, 16]. As we know, in some oxidation reactions, iron tetraarylporphyrins can act as trusted catalysts, owing to the emergence of the active substances during these reaction processes, that is, iron oxo complex. It has been demonstrated that the substituents of fluorinated phenyl moiety immobilized over the iron-porphyrins facilitate the conversion and can prevent the decomposition of the macrocycle of porphyrin to impart a more stable catalyst [17, 18]. Herein, fluorinated iron-porphyrin conjugated porous polymer with micro/mesopore size was prepared via Sonogashira-Hagihara coupling polymerization to combine the well catalytic effects of fluorinated iron-porphyrins and high stabilization of porphyrin containing porous polymers. The pore size distribution (PSD) and pertaining pore size adjustment of the most of reported polyporphyrin CMPs are within the micropore size scope. To our best knowledge, this is one of the rare examples of micro/mesoporous polyporphyrin CMPs. The prepared polymer was also studied as the heterogeneous oxidation catalyst by the oxidant of dioxygen. 1,4-diethynylbenzene and tetrakis(triphenylphosphine)palladium (0) were commercially available from Acros company. Copper(I) iodide and triethylamine were ordered from J&K chemical company. Various substituent toluene, cyclohexanone, and benzaldehyde were purchased from Aladdin chemical company. Iron(III) 5,10,15,20-tetrakis (2,3,5,6-tetrafluoro-4-iodophenyl)porphyrin (M1)  and iron(III) 5,10,15,20-tetrakis(4-bromophenyl)porphyrin (M2)  were prepared through methods reported by the literatures. Other reagents and solvents were also commercially available and used as original states. The details of this section were shown in the Electronic Supplementary Material. The corresponding details were also shown in the Electronic Supplementary Material. To the mixture of DMF (15 mL) and triethylamine (10 mL) were added 1,4-diethynylbenzene (25 mg, 0.2 mmol) and M1 (150 mg, 0. 1 mmol). The mixture was degassed by the freeze-pump-thaw cycles and polymerized under the catalytic systems of tetrakis(triphenylphosphine)palladium-(0) (15 mg) and copper(I) iodide (5 mg) for 24 h at 120 °C under a nitrogen atmosphere. The resulting solid was filtered and washed with water and tetrahydrofuran. Purification of the polymer was implemented by Soxhlet extraction with water, methanol, and tetrahydrofuran for 48 h. Finally, the brown powder FCMP-1 (115 mg) was obtained after drying for 12 h at 115 °C. Catalytic oxidation of substituted toluene to the corresponding benzoic acid was performed in a stainless-steel autoclave using oxygen as an oxidant. In the typical procedure , to a solution of toluene and NaOH in methanol in a 100-mL stainless-steel autoclave reactor was added the catalyst. The reactor was sealed and pressurized by 1.5 MPa of oxygen. After being heated to 55 °C and stirred for 12 h, the reaction system was cooled to room temperature and the oxygen gas was safely vented. The polymeric catalyst was separated from the reaction mixture by filtration or centrifugation. The reaction solution was poured into water and filtered. The resulting water phase was acidified with concentrated aq. HCl to give the crude benzoic acid derivatives. After filtration and drying, the desired compounds were purified by recrystallization. For the experiments , cyclohexanone (2.5 mmol) and benzaldehyde (5.0 mmol) were added to the solution of catalyst (0.2 mol%) dispersed in l,2-dichloroethane (10 mL). The final mixture was stirred and heated to 45 °C, and at the same time, oxygen gas was bubbled into the reaction system for 5 h. When the reaction solution was cooled to room temperature, the polymeric catalyst was separated from the reaction mixture by filtration or centrifugation. Formation of esters can be detected by gas chromatography with yield calculated based on the consumed cyclohexanone during the reaction. For catalyst recycling, after being separated by centrifugation firstly, washed with l,2-dichloroethane thoroughly, and further dried for 16 h, the catalyst was recovered and could be employed as the regenerated catalyst in the next catalytic run. It is well known that the Sonogashira-Hagihara coupling polymerization is mostly used for synthesis of CMPs . Therefore, fluorinated porphyrin monomer M1 was produced for the coupling polymerization with 1,4-diethynylbenzene, and the desired network polymer FCMP-1 was obtained under the conventional reaction conditions (Scheme 1). Similarly, according to the previous report , the coupling of the starting building monomer without fluorosubstituent (M2) was also accomplished smoothly and efficiently to afford CMPP-2, which can be used along with FCMP-1 for studying the effects derived from the fluorinated phenyl substituents of the Fe-porphyrin on porosity and function of corresponding porous polymers. FT-IR spectroscopy analysis demonstrated the formation of carbon-carbon triple bond functional groups in FCMP-1 due to a new characteristic vibrational peak at 2200 cm−1 (Fig. 1a). Besides, both M1 and FCMP-1 have characteristic vibrational peaks at 1002 cm−1 (Fig. 1b) corresponding to the presence of Fe-N bond, which indicates that the structure of iron-porphyrin was not destroyed during polymerization. 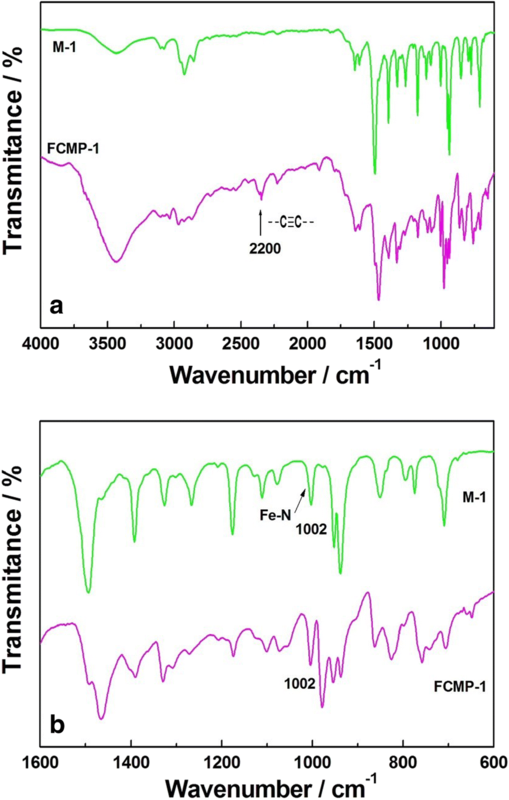 X-ray photoelectron spectroscopy (XPS) was performed to identify the element species of FCMP-1, which were indicated in Fig. 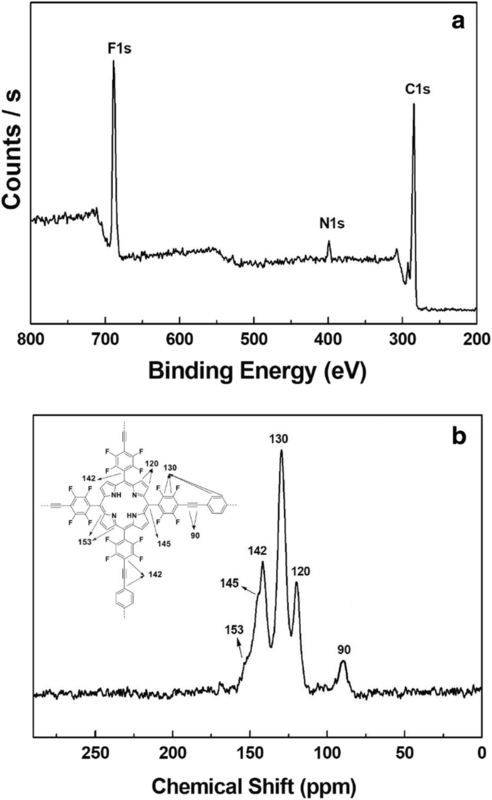 2a by 688.3 eV for F 1 s, 398.8 eV for N 1 s, and 285.3 eV for C 1 s. Owing to the high-spin paramagnetic effect of Fe(II)-porphyrin complex, FCMP-1 do not give good signal intensities of 13C CP/MS NMR spectrum. The free-base porphyrin analogue polymer without high-spin paramagnetic effect was prepared purposely and characterized at the molecular level by the solid-state 13C CP/MAS NMR spectrum, which is shown in Fig. 2b. The signal peak at 153 ppm corresponds to the carbon linked to the N atom in the porphyrin macrocycle. The peak at 145 ppm is ascribed to the carbon linked to the 1,2,4,5-tetrafluorobenzene moieties in the porphyrin macrocycle. The peak at 142 ppm corresponds to the aromatic carbon linked to the ethynyl moieties. The signal peak with high intensity at 130 ppm is ascribed to unsubstituted carbon of phenylene and the 1,2,4,5-tetrafluorobenzene moieties. The peak at 120 ppm corresponds to the unsubstituted carbon in the porphyrin macrocycle. The peak at 90 ppm corresponds to the alkyne carbon from the linker 1,4-diethynylbenzene, which is consistent with conclusions by its FT-IR spectroscopy. The successful preparation of FCMP-1 and its chemical structure have been thoroughly verified by systematical analysis mentioned above. To give insight to the thermal stability of FCMP-1 and the corresponding synthetic monomer M1, thermogravimetric analysis was performed and the TGA plot was shown in Fig. S1. Both FCMP-1 and M1 have high decomposition temperature (higher than 300 °C) account for the high thermal stability. When the temperature is above 300 °C, the residual mass of the polymer is more than the corresponding monomer, which indicates that the polymer possesses higher thermal stability. The difference of thermal stability between the monomer starting material and the final polymer can be attributed to the presence of crosslinked structures of the prepared polymer, which also demonstrates the successful synthesis of FCMP-1. The SEM and TEM images of the polymer are shown in Figs. S2 and S3 (in the Electronic Supplementary Material), indicating that FCMP-1 exhibits agglomerated solid particles with different size between 100 and 300 nm. To study their porous properties, nitrogen physical adsorption/desorption measurement of polymers was carried out. The corresponding nitrogen adsorption/desorption isotherms collected at 77 K are shown in Fig. 3a. The nitrogen sorption isotherms of CMPP-2 exhibit a combination of type I and II isotherms like the previous report. However, FCMP-1 possesses a combination of type I and IV nitrogen sorption isotherms according to IUPAC classifications  and shows a significant H2 hysteresis loop in the desorption branch, consistent with a mesoporous structure [26, 27]. Nitrogen adsorption of both polymers has a sharp rise at a relative pressure of 0–0.1, also indicating the existence of microporous structures. To further confirm the pore size of these two materials, the PSD plots calculated from the adsorption branch of isotherms by the NLDFT method are shown in Fig. 3b. Pore sizes of FCMP-1 are mainly distributed in 0.81 nm and the range of 2.9–3.4 nm. For CMPP-2, its PSD is mostly centered at 0.72 nm. The relative pressure (P/P0) scope from 0.01 to 0.10 was used to determine the specific surface area value of the two polymers. The BET-specific surface areas of FCMP-1 and CMPP-2 are calculated as 440 and 407 m2 g−1, respectively . The data of key porosity of the obtained materials including BET-specific surface area, dominant pore size, and pore volume are shown in Table 1. Methane as a greenhouse gas is the secondary driver after carbon dioxide of global warming . Simultaneously, methane can be used as the feedstock of clean energy, such as natural gas. However, the concentrates of methane from different sources are quite diverse and can be grouped from dilute to high purity (> 90%) . It is necessary to tailor adsorbent to capture and storage methane, enhancing the concentrate of it for the need of practical application, for example the fuel energy in vehicular . The methane uptake capacities of the prepared polymers were tested at 273 K (Fig. 4a). In view of the alike structure of FCMP-1 and CMMP-2, specific surface area and total pore volume of the two polymers may play pivotal roles for capturing and storaging methane. The methane uptake capacity increases with an increase in the specific surface area and total pore volume. 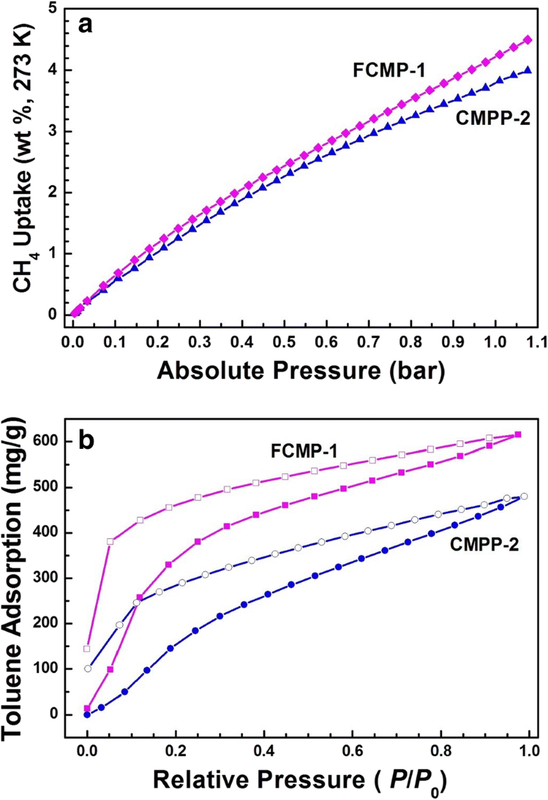 FCMP-1 has the higher adsorptive property of 4.23 wt% at 1.0 bar, which can be comparable with several porous materials with higher BET-specific surface area such as microporous polycarbazole CPOP-14 , MOF Cu2(ebtc) , porous polyporphyrins , and porous polymers containing adamantanes  under the same conditions. 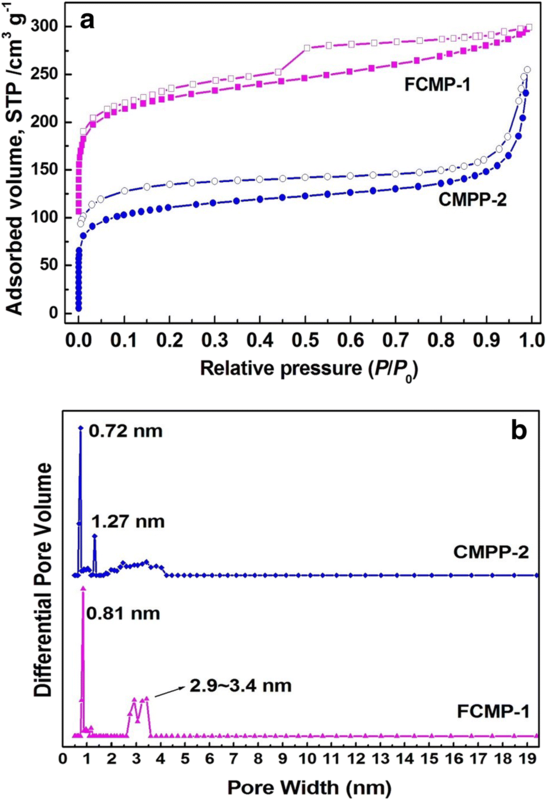 Porous materials with higher specific surface area and pore volume endow potential access by the small molecules; therefore, the capabilities of FCMP-1 and CMPP-2 for adsorption of solvent vapor were also explored. The harmful aromatic solvent toluene is selected as the adsorbed vapor, considering that FCMP-1 can act as an alternative adsorbent for absorbing and removing small but toxic aromatic molecules in the lab or air, since this polymer containing fluorinated phenyl substituents possesses a stronger affinity for the aromatic compound than the corresponding fluorine-free material. As shown in Fig. 4b, in the entire relative pressure range, the adsorption capacity of FCMP-1 for toluene is as much as 615 mg g−1, higher than that of CMPP-2 (480 mg g−1). The toluene uptake performance of FCMP-1 is not as good as some reported porous polymers, for example,CPOP-9 (1355 mg g−1) , BO-CMP-2 (1125 mg g−1) , and PAF-1 (1357 mg g−1)  but is better than the others with higher BET-specific areas under the same conditions, such as CPOP-17 (551 mg g−1, SBET 700 m2 g−1) , CPOP-18 (525 mg g−1, SBET 1040 m2 g−1) , and oBO-CMP-2 (561 mg g−1, SBET 540 m2 g−1) . The higher sorption capacity of FCMP-1 for toluene might be attributed to its high porosities and binding affinities derived from π–π, arene-perfluoroarene, and C–H·π interactions [39, 40]. As biomimetic catalysts, metalloporphyrins combining with various oxidants have been widely used for oxidative transformation during the past decades . However, some drawbacks for the homogeneous catalytic processes during the industrial manufacture are unavoidable, which are known as pollutions caused by heavy metal and high cost induced by recovering problems. The heterogeneous catalytic systems are recyclable and reusable catalyst systems , which can avoid these drawbacks. Especially, the porous materials as heterogeneous catalysts have the positive effect on the heterogeneous catalysis process due to their porous channels favorable for mass transfer and molecule diffusion. Fe(II)-porphyrin compounds have been reported as effective catalysts for preparation of substituted benzoic acid by oxidation corresponding toluene in the presence of molecular oxygen. To verify the catalytic properties of FCMP-1 and CMPP-2 as heterogeneous catalysts, catalytic oxidation of the substituted toluene was investigated in the basic methanol solution under the oxygen atmosphere (1.5 MPa) at 55 °C for 12 h. The results are shown in Table 2. In synthetic chemistry, the BV reaction  is often used for the synthesis of esters from the corresponding ketones by oxidation. Usually, the oxidants are organic peroxy acids, which are not advantageous for environment and production cost in the industry due to the expensive and hazardous features. Recently, as a green synthetic method, BV reaction using molecular oxygen as the oxidant has been developed, in which Fe-porphyrin complex combined with benzaldehyde can be one of important catalyst systems . Herein, as shown in Table 3, BV oxidation reaction using cyclohexanone as the starting material for preparing ε-caprolactone by dioxygen was also employed to indicate the catalytic performance of FCMP-1 and CMMP-2 as heterogeneous catalysts. From the data shown in Tables 2 and 3, the compounds and materials derived from Fe-porphyrin complexes can act as the efficient catalysts in the model reactions. The control reactions without catalyst exhibit the low yield of production. Monomers M1 or M2 can act as the homogeneous catalysts with good catalytic performance; however, the recycling and separation problems are unavoidable. Porous polyporphyrins FCMP-1 and CMPP-2 were studied as heterogeneous catalysts. Under the given experimental conditions, the yields for substituted benzoic acid are ranged from 62 to 88% by using FCMP-1 and the other catalysts. The best is for FCMP-1 in catalytic oxidation of p-nitrotoluene to the p-nitrobenzoic acid. As for the reaction for production of ε-caprolactone (more than 99% selectivity), the yields are ranged from 85 to 98%. The channels derived from porous structure of Fe-porphyrin network, especially for FCMP-1 with micro/mesoporous structure, are beneficial not only for the reactive molecules easy to contact with the catalytic sites but also for accelerating the diffusion of reactant and product molecules [43, 44, 45]. Therefore, porous Fe-porphyrin networks exhibit the comparable catalytic activities with the Fe-porphyrin complex molecules as homogeneous catalyst. In general, the catalytic performance of CMPP-2 as a heterogeneous catalyst is not as good as some homogeneous ones such as M1 and M2 employed by this work in some cases. 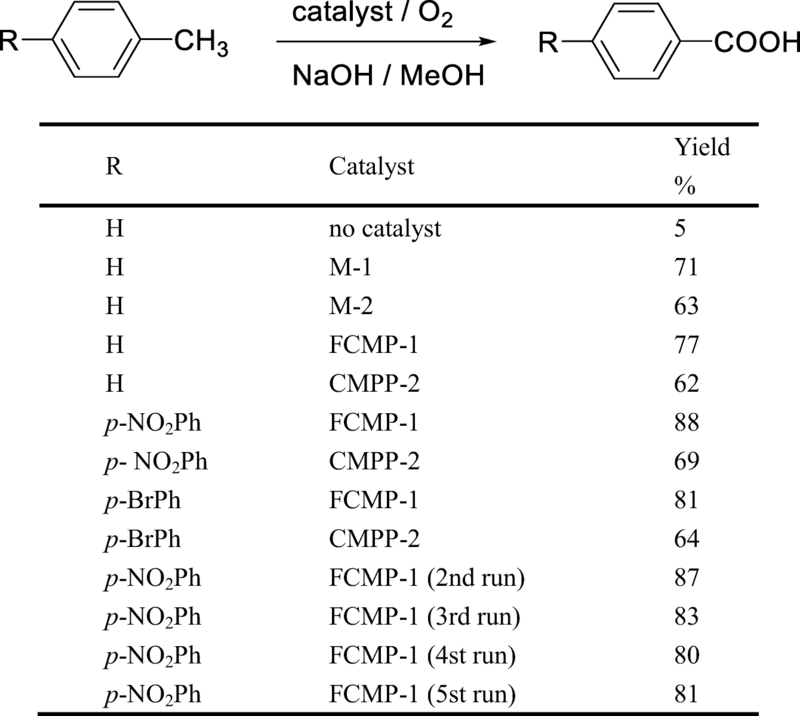 Meanwhile, the relevant capability of FCMP-1 with the substituents of fluorinated phenyl moiety is better to be as a recyclable and reusable heterogeneous catalyst in comparison with some other catalysts. The polymeric catalysts are simply isolated from their reaction mixture by filtration or centrifugation followed by wash and drying for reuse. For instance, in the BV reaction, the yield for ε-caprolactone in the fifth cycle catalyzed by FCMP-1 is still up to 80% (Entry 4, Table 3) under the given experimental conditions. As comparison, the catalytic reactions promoted by CMPP-2 were also done smoothly, but the relevant yield is only 65% not as good as FCMP-1 (Entry 5, Table 3). The similar results are found for FCMP-1 in catalytic oxidation of p-nitrotoluene to the p-nitrobenzoic acid. The better catalytic efficiency and recycling effect are found for FCMP-1 with high porosity. Meanwhile, we also find that the catalytic activities of porphyrin containing the fluorinated phenyl substituents (M1 and FCMP-1) are higher than those of M2 and CMPP-2. In light of the possible mechanisms shown in Fig. S4, the key intermediate of the catalytic oxidation in the main step is high-valent Fe-porphyrin , that is, (FCMP-1)FeV=O, which can also promote the oxidative breakdown of the porphyrin ligand. This is the side step of the catalytic oxidation leading to the decrease of porphyrin as effective catalyst sites in every recycling run. That is the reason why the yields of the catalytic reactions are gradually decreasing when the recycled catalysts were used every time. It has been proven that the substituents of fluorinated phenyl moieties coupled to the Fe-porphyrin have a stabilizing effect on porphyrin to restrain the breakdown of the catalyst, which is advantageous to the oxidative transformation. In summary, fluorinated iron-porphyrin conjugated porous polymer FCMP-1 with micro-/mesopore size was synthesized by Sonogashira-Hagihara coupling polymerization. To our best knowledge, this is one of the limited examples of micro/mesoporous polyporphyrin CMPs. The obtained polymer with robust chemical and thermodynamic network exhibits permanent porosity and moderate BET-specific surface area about 440 m2 g−1. Since the material containing fluorinated phenyl substituents possesses a stronger affinity for the aromatic compound than the corresponding fluorine-free materials, the adsorption capacity of FCMP-1 for toluene is as much as 615 mg g−1 at room temperature, which is higher than that of the polymer analogue without fluorinated substituents. The prepared polymer was also studied as the heterogeneous oxidation catalyst for the substituted toluene oxidation and BV oxidative transformation employing dioxygen as the oxidant. Under the given experimental conditions, the yields of substituted benzoic acid are ranged from 62 to 88% by using FCMP-1 and the other contrast materials as catalysts. Particularly, the yields of the reactions for preparing ε-caprolactone (more than 99% selectivity) are ranged from 85 to 98%. By comparison, FCMP-1 with high porosity and fluorinated substituents outperforms CMPP-2 in catalytic performance and cyclic usage. The substituents of fluorinated phenyl moieties linked to Fe-porphyrins facilitate the transformation, due to their stabilizing effect on porphyrin to restrain the breakdown of the catalyst. Qi Chen is also grateful to the selfless support from Prof. Dr. Bao-Hang Han in the National Center for Nanoscience and Technology, China. Financial support was from the National Natural Science Foundation of China (Grants 21574031, 51873053, 61761016 and 51775152), the Key Research and Development Plan of Hainan Province (Grant ZDYF2018004), and the Science and Technology Cooperation Project of Guizhou Province (Grant QKHLHZ-2015-7564).